January is notoriously the busiest month for gymgoers; and if you're committing to better fitness habits this year, then you should do it with style. January is notoriously the busiest month for gymgoers; and if you're committing to better fitness habits this year, then you should do it with style. 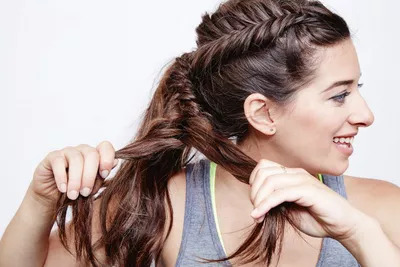 To help up your workout hair game, we asked celebrity stylist Sarah Potempa to create five easy braided looks that will hold your strands in place in the most eye-catching way. Bobbi Brown makeup artist Kim Soane painted the faces of our fitness blogger models, Chase Lindsay Rosen of Athleisurely and Evann Clingan of her eponymous site, using long-wear, waterproof products. Everything was photographed at the iconic Chelsea Piers, which boasts a bevy of creative sweat-inducing classes. Every day this week, we will be revealing a new look. First up, we have what Sarah dubs the Fishtail Ponytail Braid created on Chase. It only take four steps to DIY, and it's perfect for a cardio session — like that Beyoncé dance class you keep meaning to take! Section the hair over one eyebrow as if you were creating a side part, and sweep all of it over to one side. Clip it out of the way. “Having a clean part will make your braid look cooler,” Sarah said. Grab two little sections of hair and start plaiting a dutch fishtail braid by weaving the hair under (instead of over). The key to the french portion of it is that you’re adding a bit of the hair from the root every time you weave a piece. 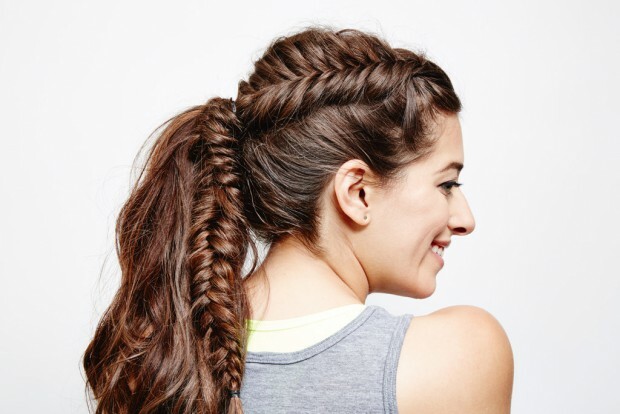 Repeat the french dutch fishtail weave all the way until you get to the spot where you would pull your mane into a high ponytail. 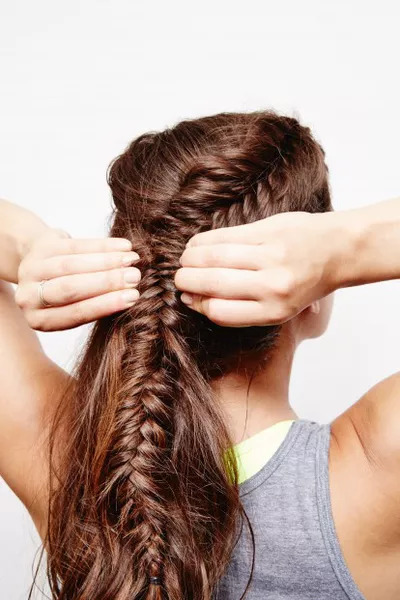 Instead of continuing it as a french braid, plait it as regular fishtail (wrapping the pieces over the middle section). Secure your ponytail with two elastics: a regular thick elastic and a clear one. "If you’re going to do cardio or a dance workout it’s nice to double up on your ponytail so that it doesn’t start to sag,” Sarah noted. 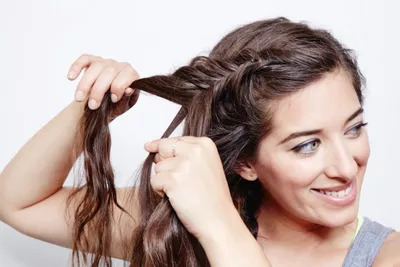 To make the braid look bigger and more textured, gently pull at the edges of it. Using a curling iron, such as the Beachwaver, create about five or six loose curls in random direction. 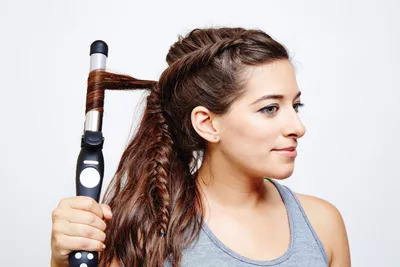 It will make your mane look extra cool when you’re dancing and moving.